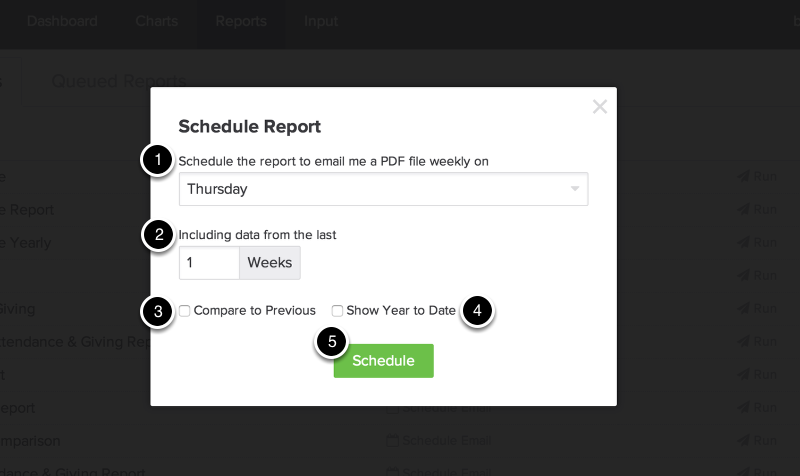 Scheduling reports is a quick and easy way to get your data delivered to yourself automatically each week. You can set them to be sent on a specific date and even select how much data to include. These reports are delivered in PDF format so they are easily able to be forwarded to those that need to see the data. Select the "Reports" tab from the menu bar at the top of the page. Locate the report you would like to schedule and then select "Schedule Email Report"
Select the Day of Week you would like the email sent to you. NOTE: The email will be sent the morning your Report is scheduled. Select how many weeks&apos; worth of data you&apos;d like to receive. For example, if you want 1 month of data sent to you, you can select "4 Weeks". If you check "Compare to Previous," you will receive data for the selected timeframe and the timeframe before it. If you select "Show Year to Date", your report will also display the data from the first of the year until now. If you have set your Report up properly, you will see the "Scheduled report successfully created!" banner.